« Tequila…From Mexico to the World! 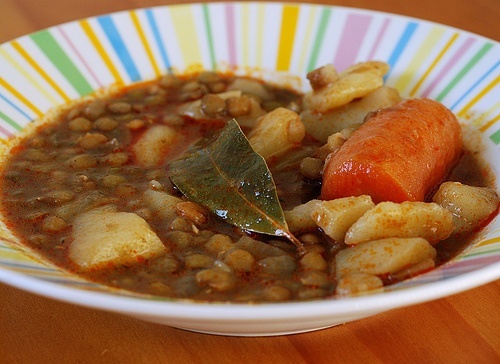 Delicious Lentil Stew with Carrots!! You are probably already well acquainted with this tasty and highly nutritious member of the legume family – lentils. How nutritious? Well, where do I begin? The fact that lentils are extremely high in fiber benefits us in many ways. The high fiber content in lentils helps reduce cholesterol levels. It’s a special asset to those with diabetes, hypoglycemia, or insulin resistance as it supplies the body with constant, slow-burning energy in the form of complex carbohydrates, and it keeps blood sugar levels from rising too quickly after eating. Fiber also contributes to a healthy digestive system and intestinal tract, thus helping to prevent certain digestive disorders. Since lentils also replenish the body with iron, they are especially valuable to those who may be at risk for iron deficiency. Furthermore, the magnesium, folate, and vitamin B-6 contained in lentils promote a very healthy cardiovascular system. And lentils are not only a great source of protein (particularly when combined with rice) but they’re also very low in fat. If lentils aren’t already an important part of your diet, I’m sure they’re going to be from now on! First, thoroughly clean the lentils by adding water and agitating them with your hand, thus removing any pebbles, dirt, etc. Then rinse them once or twice and set aside. Over medium heat, sauté the onion and chile in olive oil until tender. (This is the time to add and cook the chorizo if you’re including it in the recipe.) Add garlic, cilantro, tomato, and bay leaf and cook until tomato is soft and easy to mash and blend with the other ingredients. Add the lentils, water, salt to taste and cumin (which facilitates one’s digestion of lentils.) Turn up to high heat and bring to a boil. Add carrots and potatoes. Reduce to low and simmer partially covered for 30 minutes. Check occasionally to make sure too much water hasn’t evaporated. If necesary, add hot water as necesary to just cover the lentils. Add bacon and cook another 5-10 minutes, checking water level. (This is a nice addition to the flavor, especially if you’re not adding chorizo.) Add more salt to taste as needed. Serve as a side dish or as main dish with rice and warm corn or flour tortillas and maybe a little hot salsa if you want to spice it up a bit! This entry is filed under Soups & Stews. You can follow any responses to this entry through the RSS 2.0 feed. You can skip to the end and leave a response. Pinging is currently not allowed.